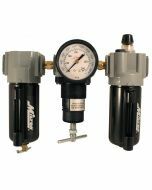 1/2" NPT Deluxe FRL trio is a filter, regulator and lubricator all in one. The filter comes with an automatic overnight drain which will operate whenever liquid accumulates in the filter bowl. 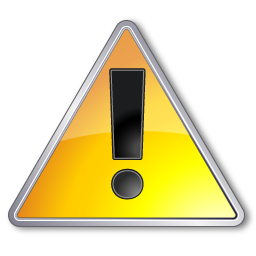 The regulator is the relieving type which will exhaust air downstream when pressure rises above the maximum preset pressure. The drip type lubricator allows for precise setting. This pre-assembled unit has polycarbonate bowls with metal bowl guards and includes a gage. 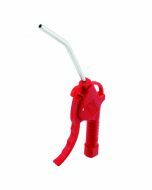 Offers a maximum of 250 PSI and 100 SCFM. 40 micron filter element.